Boasts 41 Highway MPG and 44 City MPG! 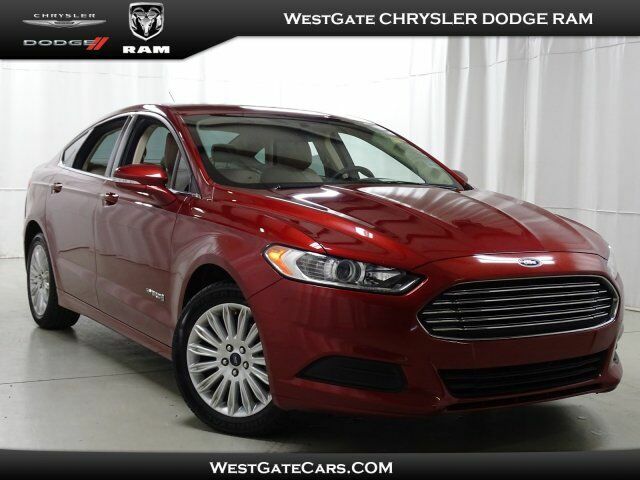 This Ford Fusion has a strong Gas/Electric I-4 2.0 L/122 engine powering this Variable transmission. Carfax reports 7 Service Records. Wheels: 17" Unique Aluminum, Wheels w/Silver Accents, Trunk Rear Cargo Access, Trip Computer, Transmission: E-CVT Automatic. Tires: P225/50VR17 BSW All Season, Systems Monitor, SYNC Communications & Entertainment System -inc: MyFord, 911 Assist, VHR, SYNC Services, Bluetooth, steering wheel controls, USB port and auxiliary input jack, Strut Front Suspension w/Coil Springs, Speed Sensitive Variable Intermittent Wipers, Spare Tire Mobility Kit, Single Stainless Steel Exhaust w/Chrome Tailpipe Finisher, Side Impact Beams, Selective Service Internet Access, Securilock Anti-Theft Ignition (pats) Engine Immobilizer. Carfax reports: 7 Service Records. No Accidents Reported. A short visit to Westgate Chrysler Jeep Dodge Ram located at 6421 Old Westgate Rd, Raleigh, NC 27617 can get you a trustworthy Fusion today!